Apoptosis, or programmed cell death, is related to many diseases, such as cancer. Apoptosis is triggered by a variety of stimuli including members in the TNF family and prevented by the inhibitor of apoptosis (IAP) proteins. IAP proteins form a conserved gene family including IAP, XIAP/ILP-1/MIHA, and Livin/KIAP that bind to and inhibits specific proteases. A novel member in the IAP protein family was recently identified and designated ILP-2 for IAP-like protein-2 (1). ILP-2 has high homology to ILP-1, but is encoded by a distinct gene that is solely expressed in testis of tested normal human tissues (1). ILP-2, unlike ILP-1, has no inhibitory effect on Fas and TNF induced apoptosis, but potently inhibits apoptosis induced by overexpression of Bax or by coexpression of caspase-9 with Apaf-1. ILP-2 interacts with the processed caspase-9. These results suggest that ILP-2 is a novel IAP family member with restricted specificity for caspase-9. Our Abpromise guarantee covers the use of ab9664 in the following tested applications. WB Use a concentration of 1 - 2 µg/ml. Detects a band of approximately 33 kDa.Can be blocked with Human ILP2 peptide (ab9665). Western blot analysis of ILP-2 expression in human HepG2 (lane 1) and MOLT4 (lane 2) cell lysates and mouse spleen (lane 3) tissue lysates with anti-ILP-2 at 1 µg/ml. 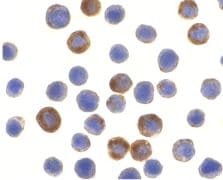 ab9664 at 10µg/ml staining ILP2 in HepG2 cells by Immunocytochemistry. Publishing research using ab9664? Please let us know so that we can cite the reference in this datasheet. There are currently no Customer reviews or Questions for ab9664.